Editors’ Note: This digest, written by Ashley Rudo Chisamba, an Information and Membership Officer with the Women’s Coalition of Zimbabwe provides a local perspective and voice from the field on the day of this important national vote. African Futures wishes to highlight the work of this organization and the countless other civil society groups working to support a peaceful and representative electoral process. Zimbabwe‘s national elections will occur on the 31 July 2013, officially ending the transitional phase and term of the Government of National Unity. The run-up to elections has been marked by high contestation over election dates, constitutional reforms, the voter roll and electoral readiness. The parties in the Government of National Unity; Zimbabwe African National Unity-Patriotic Front (ZANU-PF), Movement for Democratic Change (MDC), and Movement for Democratic Change – Tsvangirai (MDC-T) have been bickering over the proclamation of the election date and the reform of various policies in order to create a conducive environment that promotes free and fair elections. Consequently, the Women’s Coalition of Zimbabwe (WCoZ) has collectively created a platform for women’s organizations to coordinate and attend to issues concerning women’s participation in the forthcoming elections. Specifically, it set up a Women’s Situation Room to enhance women’s participation and ownership of governance processes in line with the UNSCR 1325 and the SADC Protocol on Gender and Development, which demand an increase in the number of women in governance structures. Through its membership, WCoZ has used the Women’s Situation Room concept to encourage female candidature as well as women’s participation as voters. The Women’s Situation Room (WSR) advocacy cluster comprised of WCoZ, Zimbabwe Women Lawyers Association (ZWLA) and Women in Politics Support Unit (WiPSU), convened five provincial based workshops on Women Peacebuilding and Conflict Management. These meetings were useful at spreading these concept to women from all segments of Zimbabwean society, and encouraged women to be involved in peacebuilding and conflict management efforts within their respective communities. The workshops also helped organizations strategize on how to better integrate efforts to ensure women share information and collectively participate in electoral issues regardless of their various backgrounds. The advocacy cluster also held a women leaders interparty meeting with the female leadership from the three main political parties in the Government of National Unity (MDC-T, MDC and ZANU-PF) to discuss how to ensure peaceful elections and women’s effective participation, with an emphasis on their role as candidates. The WCoZ also created a Roadmap to Elections, a set of basic principles, reforms and minimum conditions needed for a free and fair vote for women. Another body of the work of the Women’s Coalition of Zimbabwe, The Women in Politics Support Unit (WIPSU) focuses on the Vote for a Woman Campaign, which aims to mobilize the electorate to back female politicians in the forthcoming elections. Women have used this structure and the new constitution as a platform to campaign for posts and positions of power. The Women’s Trust (TWT) also has a complementary campaign SiMuka Zimbabwe (Arise Zimbabwe), which encourages women to register and vote for a woman in the forthcoming harmonized elections. Nevertheless, women’s representation, and treatment in the already held primary elections of June 2013 raises concern. The principal political parties are using the new quota in the new constitution that reserves sixty parliamentarian seats for women and this has created a constraining and no-win situation for female candidates. Women are being confined to the seats and are restricted from competing at constituency level and becoming direct representatives. Finally the Women’s Coalition of Zimbabwe has set up a structure of networks organized by cluster (information, advocacy, medical, legal and shelter) to provide aid and assistance for women that may be violated during election period. Through this organization and others’ efforts, the women’s movement has been far more proactive in the lead up to the 2013 elections than it was prior to the 2008 vote. Despite these improvements, several of their programs remain unfunded, leaving unfortunate gaps in the Coalitions’ desired impact. However, this has not stopped the women’s movement in its tracks. As the first ballot is soon to be cast, women are working collectively to promote women’s participation and women’s vote for a woman! 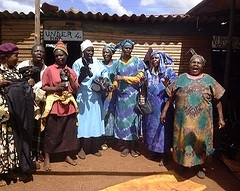 [i] A.P Reeler, “Zimbabwe women and their participation in elections,” Research & Advocacy Unit, December 2011, http://www.researchandadvocacyunit.org/index.php?option=com_docman&task=doc_download&gid=112&Itemid=90. Beautiful article by Ashley Rudo Chisamba.